First thing’s first – let’s address the price. At £299, like pretty much anything produced by the scientists at Dyson, it doesn’t come cheap. So why the hefty price tag? Well, Dyson spent $71million developing their latest product, building new dedicated beauty testing labs, hiring new engineers, employing the expertise of top stylists such as the Kardashian clan’s go-to hair hero Jen Atkin and getting hold of 1,000 miles (yes, really) of human hair to try 600 prototype dryers. So it hasn’t been the cheapest product to produce. Are you sure it’s a hairdryer? In true Dyson style, they’ve sort of thrown out the rule book when it comes to design, too. Forget your run-of-the-mill circular fan models, Dyson’s hair dryer is basically a big hole. In the same way that their large bladeless floor fans work, the cylinder makes use of the brand’s ‘Air Multiplier technology’, which takes air from all sides, multiplies it’s power, and pushes it out onto your hair through the ring. According to the web, the Dyson hair dryer is six times smaller and three times lighter than your average hair dryer, despite delivering such a powerful airflow. So no matter how long you spend perfecting the perfect curled-under blow-dry, your arms will never grow tired. There are also four temperature settings and three airflow settings, so you should find the perfect level of ‘blow’ required for your exact hair type, and prevent damaged or delicate locks from getting heat-damaged (FYI, if your hair is prone to breakages, read our 11 ways to stop hair breaking). 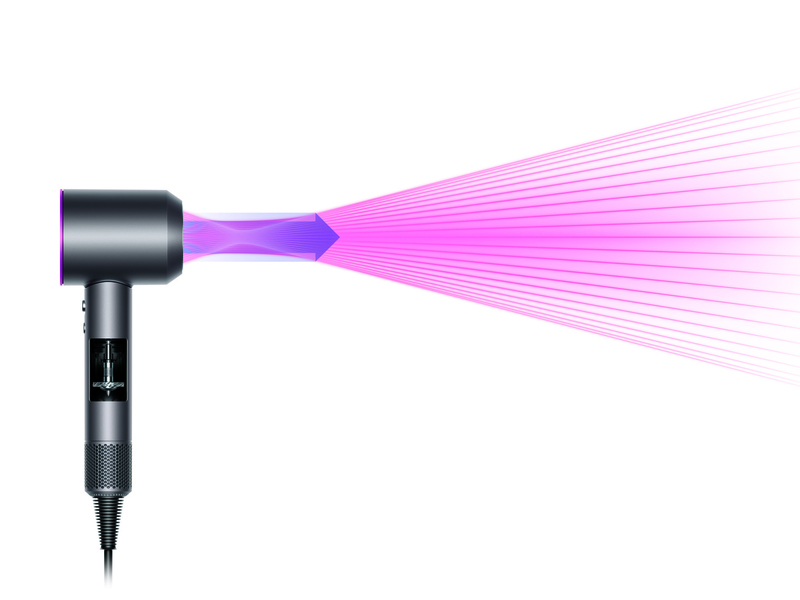 We love this fact… Dyson sent their hair dryer development engineers to hairdressing school for lessons so that they would really understand how professionals use hair dryers in their work, and could design their product to suit their needs. Pretty neat, non? One of the benefits of Dyson’s super-powerful hair dryer is that thanks to its powerful motor, it cuts drying time in half, and if it’s sleek and shiny straight locks you desire, there will be no need for straighteners after your blow-dry, meaning you can hit snooze a couple more times in the morning. Dyson Supersonic Hair Dryer costs £299 and is available now at John Lewis. As the Digital Beauty Editor here at Marie Claire, I get sent a lot of things to try. Foundations for oily skin (of which, I suffer, so am always on the prowl), the newest formulations of face creams and a shed load of hair related products. But never have I been so excited to try a hair dryer. Firstly, I have a hair dryer I’m mildly obsessed with, so very rarely venture from it and secondly, I’m yet to master the technique of drying my hair to a professional level, so I usually resort to sitting in the chair at Daniel Hershesons. But, this may have just changed the game. In the past, I’ve blow dried my hair to the point of it being such a matted mess, I’ve had to wash it again and let it air dry – the nozzle thing? Yeah. That just hasn’t worked for me. With absolute ease, I blow dried my hair in the right direction (down!) and there wasn’t a knot in sight afterwards. In fact, my hair looked so smooth, I had to go back and recall whether I’d added moroccan oil to the ends yet – I hadn’t. What was even better was the fact that it took me no time at all. I’m talking, hair drying time cut down to less than half of what it normally takes. Honestly, it’s the speediest thing I’ve ever used. It was undoubtedly quiet too. My husband is not a fan of hairdryers, because he’s usually in bed trying to sleep in when I hit the on button, but he didn’t even flinch when I started this one up.